It is no secret that a dominant voice in contemporary Unitarian Universalism is one that believes the existence of any God is irrational. For many, even entertaining the possibility by mentioning God in Unitarian Universalist worship is downright offensive. We are, after all, “smarter” than that. The function of reason as a means by which Unitarian Universalists process possibilities is an extremely important characteristic of the faith, and has been so since at least the nineteenth century, when Transcendentalism swept through New England and forever changed the course of liberal religious thought in America. It is this function of reason that now calls us to see that of course people of color, women, immigrants, queer people, genderqueer people, poor people, and refugees deserve the same rights and opportunities as educated, middle-class, cisgender, straight, white men. Scientifically speaking, though we are all different, we are all equal. It is science that persuades us to advocate for the care and protection of our earth home, securing its healthy existence for generations ahead. The use of reason is critical to Unitarian Universalism. However, I wonder if by stopping there we are falling short of our broader calling. Are we not also called to be both perfectly inclusive and respectful of others’ searches for and expressions of truth and meaning? To put it rather bluntly, atheism is a White Thing. That is not to say that there are no atheists of color. We all know at least one. At least, those of us who know people of color do. But, for the most part, atheism lives fairly solidly within “white space.” A 2014 Pew Research Center Religious Landscape Study (the same study that reminded Unitarian Universalists of its 78 percent whiteness) shows that 78 percent of American adults who claim to be atheists are white. Further, 11 percent of white American adults say they do not believe in God, compared to 2 percent of black adults and 6 percent of Latino adults. I contend that people of color have, by and large, clung to their beliefs in God, in whatever form, not because they are insufficiently educated, but because it is God who has given them the strength to endure, resist, and—in some small ways—overcome systems of racism and white supremacy, in the myriad ways it has persisted, for centuries. It takes a certain amount of freedom and privilege to denounce the existence of God. It is, therefore, not realistic for groups of people who have been conditioned to believe they have limited self-worth to suddenly be expected to rely upon their own human potential for success. For them, a belief in an illogical and supernatural God is absolutely reasonable—because the notion that their races have survived to this point is itself supernatural, even illogical. As far as they are concerned, they trust in the miracle-working God that helped to bring the Israelites out of Egyptian captivity—the God who continues that same miracle work today. The mysteries around the resilience of peoples of color can probably be explained away by scientific terms, but that does not serve to edify people of color, nor does it serve to empower them, despite what we might feel about education. “Empiricism,” as a term, has been co-opted by scientific purists in recent times, but does it not point toward that which we have witnessed as much as that which we have proven? In this way, one could argue that God exists in the ways oppressed peoples have experienced the impact of God in their lives, whatever that ultimately means for them. For these reasons, I believe any movement in Unitarian Universalism to make God unwelcome in our sanctuaries is effectively akin to posting “Whites Only” signs on our doors. If we are serious about being inclusive and racially diverse, we are going to have to stop the sometimes violent God-hating in our places of worship. As long as society unjustly favors white lives, people of color will need to lean upon their gods for strength, endurance, and peace of heart. It is our duty, if we mean what we say about pluralism, and if we indeed affirm the first, second, third, fourth, and sixth Principles, to provide a warm home for them, where they can fully express their spiritual selves without being judged or marginalized. This is not to say that our congregations need to go back to claiming the singularly Christian identity of our faith’s parents. No, our congregations need only to recognize and embrace the concept that, as intentional pluralists, theism is already as much a part of our identity as atheism and agnosticism. Further, this does not aim to ignore the fact that many Unitarian Universalists are living with real trauma related to their spiritual pasts and previous relationships with theistic people and/or institutions. I imagine this pain might make it difficult for those people to relate to theists and welcome them fully into Unitarian Universalist fellowship. It will take real humility for them to see and accept that many theists need Unitarian Universalism just as much as any religious atheist might. And, I would argue that Unitarian Universalism needs theists just as much—especially at a time such as now, when so much is at stake, and we are being brought to face our own shortcomings around racial inclusion and justice. 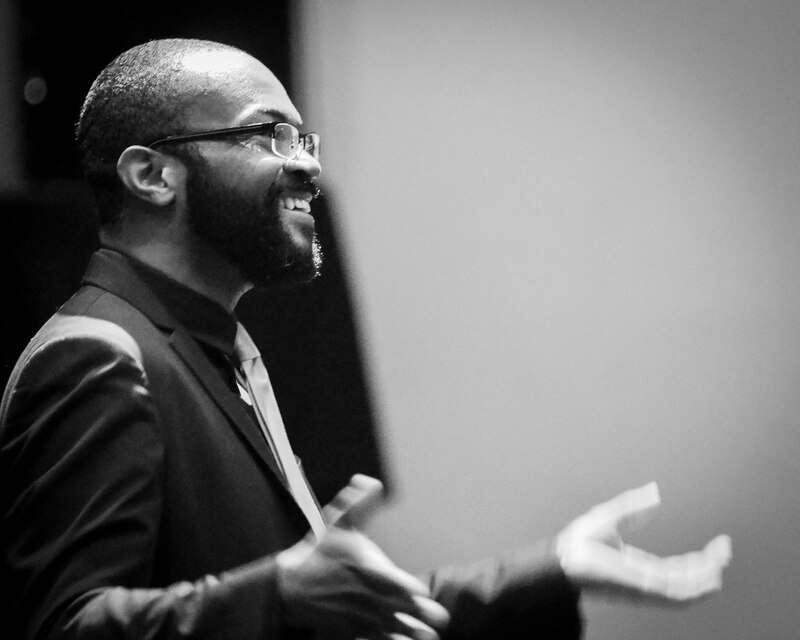 DeReau K. Farrar is director of music at First Unitarian Church of Portland, Oregon, and a member of the board and conference planning committee of the Unitarian Universalist Musicians Network. Before moving to Portland in 2016, he served UU congregations in Santa Monica and Los Angeles, California, led an interfaith community gospel choir, and worked as a freelance music director, vocal contractor, consultant, and arranger. He worked on HBO’s All the Way (2016) and Jordan Peele’s Get Out (2017).